this stunningly beautiful part of the province. is one of those tales of human passion. Ospreys usually mate for life. far above the hustle of cities and human life. to this area for eons. nearby buzz of human habitation in the background. concerned power line people and local citizens. 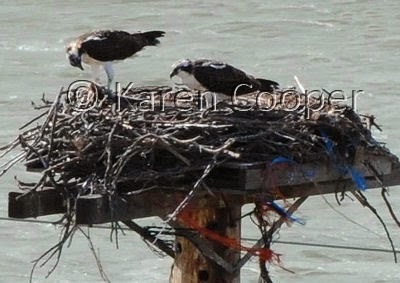 an exclusive "Osprey Pole" just for them. osprey echoing through the canyon walls. my spirit in ways I cannot describe. In the gentlest way I know, which is kind of blunt but not meant to be blunt, I believe that those nesting birds are Ospreys. They are in the same Order as Peregrines, but in the same family as eagles. The power companies have be very generous to make the nest platforms. They also do the same thing up in the Kooteneys where there are a large number of these platforms, with many of them occupied every year. Like you say, probably by the same families.